Garmin has established everything in fitness tracking line; it has running tracker, cycling tracker, golf, and even swimming tracker. But, there is one line that’s apparently still untouched by the company: Entertainment. So, in order to cover this line, the company released their new edition of fitness tracker device that is specialized in music. This device is called Garmin Forerunner 645 Music. Basically, Garmin Forerunner 645 Music is a sleek and lightweight running fitness tracker, and the “music” tagline makes the device is able to save music as well. 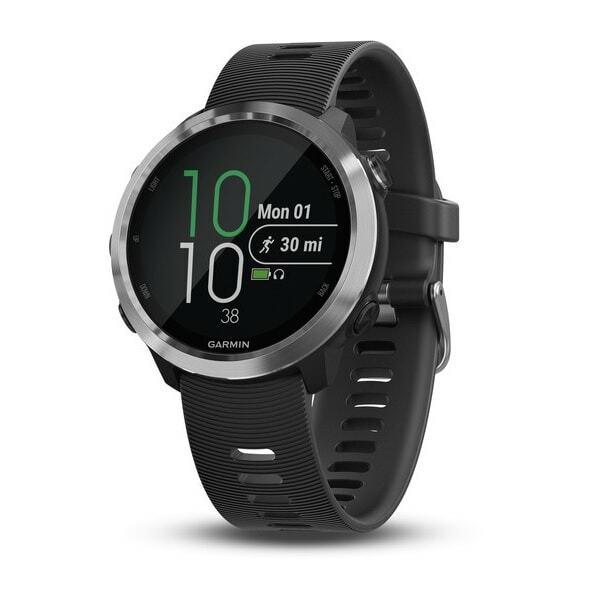 Despite the “Forerunner” label it has, in term of appearance, this device very resembles to another Garmin smartwatch called Vivoactive 3. The big difference between the two is only on the “Music” specialization, that’s probably, is aimed to bring other high end smartwatch such as Apple Watch, Samsung Galaxy Gear, or Fitbit Ionic a bit more serious competition. Design of Garmin Forerunner 645 Music is attractive yet elegant. The watch body and watch face are made of stainless steel, creating elegant impression to the overall look. Especially on the watch face, it uses 1.2-inch display with 240 x 240 pixel resolution and Gorilla glass 3 coating. This display also comes with translective technology, which results on vibrant and punchy color, with the degree of brightness is just right. Visibility is also not something to worry about here. The screen is still visible even when you’re using it for workout indoor and outdoor under the direct light. Moreover, the other interesting thing from the screen is that now Garmin making it touchscreen. This is really nice remembering that it’s very rare for the company to use touchscreen on their watch display. However, Garmin also understands that at some points, tapping the screen while running may be a difficult thing to do and impractical. So, for this purpose, Forerunner 645 Music is also equipped with buttons on its side. Not just one or two, but it’s 5 buttons, which each of them has its own function.You don’t have to be confused about which button performs which function because the button has been labeled to help you memorize the function. Wearing Garmin Forerunner 645 Music feels really comfortable because the watch is just so lightweight. On paper, it has 13.5 mm thickness with weight is just about 42.2g, which is lighter than the other Garmin watches such as Forerunner 935 and equal to Forerunner 735XT. It also has nice and lightweight silicone strap which felt so comfortable to on your wrist. And if your skin is allergic to silicone, you can just swap the strap out and change it with any standard 20mm strap, simple. Garmin has its own prestigious name on fitness tracker industry for being the top player. That’s why we should not worry much about Garmin Forerunner 645 Music features. High-end fitness tracker features such as GPS and GLONASS, Heart Rate Monitor, Compass, Gyroscope, and accelerometer are built in into the Garmin Forerunner 645 Music. And, you can also find thermometer, which is rare to be found on other smartwatches or fitness trackers on the market. With all those features, all activity data taken during run, swim, or cycle will be tracked well by Garmin Forerunner 645 Music. You can even use this device to track your activity when skiing and snowboarding. Heart rate monitor function is also very well, and the addition of 5-ATM water-resistance means you can take the tracker to swim. As for the battery, official Gamin Indonesia site says that battery could last longer about 7 days when you use it in smartwatch mode. While when you’re using it with GPS mode and music on, the device will last for about 5 hours only. Music is the highlight of Garmin Forerunner 645 Music. However, music features on this tracker is only limited to its 4GB internal storage, which can save at least 500 songs. To transfer this music into the tracker, it’s fairly simple. All you need to do is boot Garmin Express, and choose from the folder which music you’d like to add. As for you who like to listen music through online streaming, you can only stream in iHeartRadio and Deezer. So, if you already have a long music list on Spotify or Apple Music, you’ll be disappointed as you can’t stream them in Forerunner 645 Music. Lack of music streaming service synchronization is actually a risky step to take, especially when strong competes such as Samsung Galaxy Gear and Apple Watch offers this kind of feature. Indeed, it has iHeartRadio synchronization. But the problem is, not many people are using iHeartRadio as much as they use Spotify or Apple Music. However, there’s still a good side from this mechanism, where you don’t need to bring your phone while running to listen to the music because it’s already saved in the tracker’s storage. Overall, Garmin Forerunner 645 Music is a good choice of fitness tracker. It has a pleasing screen, comfortable strap, and light weight. Moreover, the tracking function on this device is pretty good too; I mean, it’s Garmin, right? But, in term of playing music, it’s a bit unpleasing if the company use “Music” tagline but not allowing the device to synchronize with live music streaming service such as Spotify and Apple music. In which, this feature starts to be common in most high end smartwatches. So, for you who want to afford this watch, this is the issue you gotta deal with. As for the price, the new Garmin Forerunner 645 Music is offered in around £350 / $400 / AU$549. This price is quite expensive, especially when you can get more common device in such a lower price such as s Garmin’s Vivoactive 3 ($250), , Apple Watch ($329), and upcoming Fitbit Versa ($200), as stated by Tom’s Guide review on this device. And Quoted from Trusted Review, “if you’re a semi-serious athlete hunting hell bent on getting a proper tracker with local music playback, the 645 is a reasonable option”.